We’ll always be from Texas, but Oregon has become a second home for us. As soon as we crossed the bridge from Vancouver, Washington to Portland, Oregon we both felt it. We had come full circle. Funny enough, we had also driven almost exactly 10,000 miles since we began this journey. We started at 70k and Brandon watched the odometer cross over to 80k about an hour outside of Portland. Finally arriving back in Portland also meant that we would be stopping for a while. We tend to move pretty fast (for better or worse) but a short stay just wasn’t going to cut it in Portland. We needed to visit all of our old haunts, catch up with old friends, go Jeeping with our buddies, and drive by our old house to see if they killed all my plants. But before we do any of that we needed to take Brandon’s mom on the grand tour! 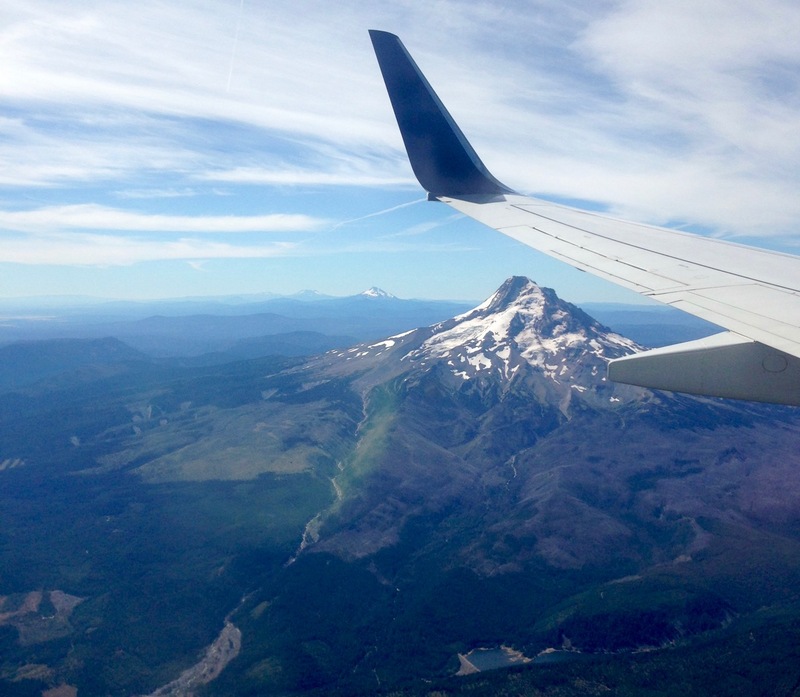 Carla would be flying in to PDX in just a few days for her first ever visit to the amazing state of Oregon! In the days preceding Carla’s arrival we hunkered down at our old favorite campground, Champoeg State Park. It felt great to be back home, but just being at Champoeg made me miss our dog Rudy. He really loves Champoeg. I know that he has been well cared for by Carla (she sends me regular updates) but walking all of our old favorite trails at Champoeg was tough. We decided not to bring Rudy on this adventure for a number of reasons, but we still think about him all the time. Our stay at Champoeg was so low-key we didn’t take a single photo. I think we both just needed a few days to recharge. We would have loved to bring Carla back to our favorite campground when she arrived, but Champoeg was totally booked up for the weekend. Instead we ended up “drive-way surfing” at our friend Eric’s house. Eric was our next-door neighbor when we lived in Portland. He moved to the little wine country town of Carlton, Oregon shortly before we sold our house. He was a fantastic neighbor and is a great friend. Thank you Eric for letting us park in your driveway (twice!). We were parked in front of Eric’s house when Brandon went to pick his mom up from the airport all the way across town. When she arrived she could not stop talking about the trees. Not surprised. The trees here get me every time. They just don’t seem to grow them like this anywhere else. Carlton is a super cute town in the Oregon wine country but it was not our destination. We were taking Carla to go see the Oregon coast and to go Jeeping at Sand Lake, a gigantic off-road playground right on the coast. The Sand Lake Recreation area covers over 1,000 acres of dunes, all set aside for off-road fun. Sand lake is also very close to one of our favorite coastal towns, Pacific City. After setting up camp at the nearby Thousand Trails campground, we took Carla into town to have lunch at the Pelican Brewery. The Pelican is one of our favorite stops on the Oregon coast. The beer is awesome, the food tasty, but most importantly, the restaurant is right on the beach looking out at Cape Kiwanda and Haystack Rock. Carla and I each ordered a sampler tray. We ended up sharing with Brandon. The overall favorite was the Kiwanda Cream Ale. While walking down the beach in front of the Pelican we got a tip from a friend on Facebook about another nearby beach that often gets overlooked by the tourists. On the other side of Cape Kiwanda is Tierra del Mar, an equally beautiful beach minus the hordes of people. You could technically walk over the Cape to get to this beach but you can also drive around and go to the beach access road. Cars are allowed on both beaches. The coolest part of Tierra del Mar was this beautiful archway hidden around the corner. You could come here a hundred times and never know this was there! At low tide I believe you could walk on the sand under the archway. Our timing was a little off and the Pacific ocean is very unforgiving so we stayed safe up on the rocks. The sand dune on the far end of the beach is the back side of Cape Kiwanda. Walk all the way to the end and over the rocks to find the arch. Now it’s just a fun place to park the Jeep, but at one point this was part of a very big tree! The next day we geared up and made our way down the road to Sand Lake. Unlike some Thousand Trails campgrounds, the one in Pacific City is very conveniently located. We were only a few minutes from town, a few minutes from Sand Lake, and a short walk from the beach. From the staging area at Sand Lake you can see how the dunes are constantly changing. The sand gradually moves with the wind, and in some cases, completely covers sections of the parking lot. Attaching a GoPro camera mount to the roof rack. Sand Lake is made up of a few different types of terrain (all covered in sand). We called this section the “knobby bits”. These tuffs of grass growing in the sand separated the beach area from the deep sand of the dunes. There were also forested areas with sandy trails weaving through the undergrowth. Most of these wooded trails were made by dirt bikes and smaller ATVs. Full-size vehicles like a Jeep just didn’t fit. But they looked like a lot of fun. From the staging area we drove straight through the knobby bits and out onto the beach. We played on the beach for hours before we realized how much more there was to the park. If you look closely you can see Haystack Rock in the distance. There were a number of these fresh water streams running across the beach and into the ocean. They say you should never go wheeling alone and this is why. Brandon’s tire slipped while driving over this log. All of a sudden he was high-centered on the log. The harder he tried to get off the log the deeper his tires dug into the sand. Lucky for us, Sand Lake is a very popular area so there is almost always someone nearby willing to pull you out. In our case, a nice guy driving a little Samurai saw us struggling and stopped to help. I think he got a kick out of being able to help out a vehicle much larger than his. He wasn’t even upset when he bent the hell out of his front bumper yanking the Jeep out of the sand. The freshwater streams flowing over the beach created a few fun little mud pits. These trails were too narrow for our Jeep. I would have loved to go hiking through them but that wouldn’t be very safe. A motorcycle or ATV could come flying around a corner at any moment. In the far left you can see the Jeep about to photobomb my selfie. I had to google this to figure out what was actually going on here. This is called a Shoe Tree and they are a sort of collaborative art form. Someone ties their shoelaces together and throws the shoes into a tree. The hope is that other people will follow suit and add their own shoes to the tree. Sometimes the shoe tree takes off and lots of people add their shoes. Other times, a tree never gets beyond a pair or two. The whole process is very organic, though you can find the locations of popular shoe trees on social media. Most of the shoes had names, dates, or messages written on them. The tree is also not limited to footwear. Someone thought it was a good idea to leave behind their Calvins. We loved finding this sign. Over time the sand has shifted so much that the post is completely buried. Also, for the record, those are not our tire tracks going behind the sign. We followed the rules and stayed within the designated area. Disregard for the rules is what gets awesome places like this shut down. Once we finally left the beach and turned inland we realized just how vast Sand Lake really is. However, it is almost impossible to get lost. The whole area runs parallel to the coastline. As long as you can find the beach you can find your way back to the staging area. Brandon tried many times to drive up this hill, but the Jeep just didn’t have the horsepower or the right tires to make it to the top. To add insult to injury, this guy came speeding by us and flew up the hill without a single problem. These guys clearly know how to have a good time. If you look closely you can see the side of a tire in the doorway. They have even more off-road toys stored inside of that trailer! We didn’t spend our entire trip driving around Sand Lake. We also spent a day driving to the nearby town of Lincoln City. Something really special about Carla’s trip to the coast was that she got to see such a wide variety of coastal weather. It was warm and sunny when we arrived but within a few days the weather turned colder with plenty of intermittent rain and fog. We really loved this type of Oregon weather and were so glad that she got to experience it. While in Lincoln City we had lunch at a restaurant called Mo’s. The fish and chips were pretty standard but the bouillabaisse was amazing. The seafood was all so fresh and the tomato herb broth everything was steamed in was perfect. Mo’s is a no-frills kind of place but the location is fantastic. After lunch we walked down the pier, hoping to see some of the seals that reportedly hang out here. We didn’t see any seals, just this happy little pug in a life-jacket. Having a third person with us meant that a number of moments were captured on camera that we don’t usually get to see. In my case, this meant a lot of photos of me taking photos. I believe all of these notches were created by fishing lines rubbing against the wood over many years. Lincoln City is well-known for artistic glass blowing. We stopped by the Jennifer Sears Glass Art Studio to shop for souvenirs and see some live glass blowing. There wasn’t a whole lot going on in the studio while we were there but the items for sale in the gift shop were amazing. Across the street they have set up a second building that houses a combination of glass art and paintings by local artists. A little side note about the Thousand Trails campground, the place is absolutely crawling with bunnies. It was the cutest infestation I’ve ever seen. Also, there was a nice trail from the campground right to the beach. The trail comes out onto Tierra del Mar about halfway between the vehicle access road and the back side of Cape Kiwanda. Before we left Pacific City we made one last trip over to the Pelican Brewery to pick up a few more bottles of the Kiwanda Cream Ale. You can find this beer at grocery stores all over Oregon, but it’s just more fun to buy it direct from the brewery. The fog was so thick that evening that Haystack Rock was only a half-stack. On the right you can see Cape Kiwanda. We didn’t hike the Cape this trip because the rocks were so slick with rain. It’s a very steep drop if you happen to lose your footing. We’ve hiked the Cape many times and now Carla has something to look forward to on her next trip to Pacific City! As I mentioned, Carla was really great about capturing some of the day-to-day moments that we are never able to photograph, like the process of maneuvering our giant bus out of a tiny parking spot. This family in the white SUV parked in the camping spot across from us right before we were about to leave. We were hoping to use that space when making the turn out of our own camping spot. Luckily, they had not yet begun unloading the car and were happy to relocate for a moment so we could make the turn. RVers and campers really are a fantastic community. People tend to be very understanding and willing to help out their fellow campers. As you can see, there was no way we could have made that turn had she remained parked where she was. So far we are really enjoying the Thousand Trails campgrounds but their narrow roads and tight spots require a bit of finesse in a large RV. By the time we left the coast Carla was totally into the groove of RV life. From here we’re heading back to the Willamette Valley to tour wine country and show Carla around Portland! Previous Previous post: Oh, Canada!